In all, 512 respondents were asked questions about gay marriage. There was a greater partisan imbalance among them than on any of the other issues probed in this research. Some 26% of the respondents to this part of the survey said they favored legalizing gay marriage, 70% said they opposed it, and 4% were undecided. The most prominent arguments people have heard about gay marriage tie to values. The following tables summarize people’s exposure to the 8 different statements we asked about. 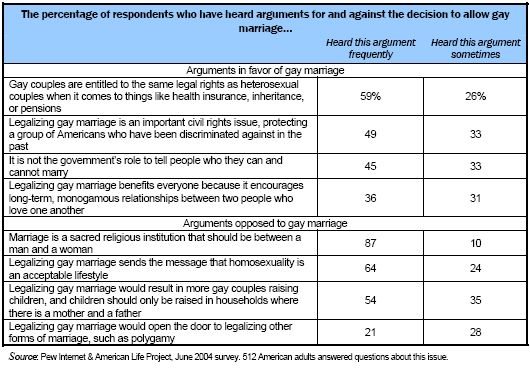 A typical respondent had heard 6.3 arguments about gay marriage. They had frequent contact with about two-thirds of these arguments, reporting that they heard 4.2 gay marriage arguments frequently. In our survey, respondents typically had greater familiarity with the arguments favoring one position than another on issues and that is certainly true here. In the case of gay marriage, they heard more arguments against legalizing gay marriage, 2.3 frequently and 3.2 at least sometimes, than for it, 1.9 frequently and 3.1 at least sometimes. Examining overall exposure, we find that supporters had more occasional contact with the arguments made about gay marriage than opponents. The number of arguments heard frequently was the same on either side of this issue. Turning to the internet, we find once again that access speed was positively related to exposure. The faster an individual’s internet connection, the greater is his or her familiarity with the statements that we asked about. Internet users do not limit their exposure to arguments supporting their position on gay marriage. Examining the extent to which respondents had greater exposure to the arguments supporting their viewpoint, we find some evidence that people have been exposed to more arguments in support of their position on gay marriage than arguments challenging their position. Partisans on both sides were more familiar with arguments consistent with the viewpoint than with those challenging it. Broadband access, however, is not a factor reinforcing this selectivity. It had no effect on exposure to argument supporting gay marriage, and respondents on both sides with broadband access typically had heard more arguments challenging gay marriage than those who share their point of view but don’t have broadband. The regression analysis shows that several factors are significantly related to exposure for arguments about gay marriage. Being males is associated with lower rates of awareness of the arguments. People living in rural areas were more likely than average to have heard a range of arguments. Respondent who used news media, including television, newspapers, magazines, and radio, were familiar with more arguments. People’s openness to finding new information was also important, though some of the results were unexpected. People who said they enjoyed reading about different things, and those who said they sometimes change their minds after reaching an opinion were both more familiar with the statements about gay marriage than those who didn’t. Surprisingly, those who said that they tend to reach a decision quickly, and had difficulty making a decision when faced with too much information were also more familiar with the arguments than those more inclined to explore an issue thoroughly. Here again, internet use was positively correlated with overall issue exposure. Internet users had heard more arguments on average than those who don’t use the internet. The internet has an impact on people’s exposure to arguments challenging their positions on gay marriage. Examining the extent to which respondents had greater exposure to the arguments supporting their viewpoint, we find some evidence that people have been exposed to more arguments in support of their position on gay marriage than arguments challenging their position. As with campaign information, broadband access is not associated with a decrease in exposure to arguments that challenge respondents’ views. Respondents with broadband access typically had heard more arguments for both sides than those who share their point of view but don’t have broadband. Omnivores: They are the vast majority of respondents answering questions about gay marriage. Some 72% of this sample were Omnivores. Again, because so many respondents fall into this category, we find that the group is quite similar to the population at large. Selective Reinforcers: Some 16% of those we asked about gay marriage were Selective Reinforcers. Members of this group were slightly less likely that the average American to follow the news. Only 53% read a newspaper on a typical day (versus 60%), and 21% get information about gay marriage online (versus 25% of omnivores). These individuals also had lower educational attainment on average, with only 8% holding a college degree. Tuned Outs: This group made up 8% of gay marriage respondents. Tuned Outs are least likely to be online (55%), and to have a broadband connection at home (13%). They also pay less attention to the news. On a typical day, 37% read a newspaper, 68% watch TV news, and 31% get news online. Finally, Tuned Outs are a more diverse racially: 60% are whites, 14% are blacks, and 16% are English-speaking Hispanics. Contrarians: The smallest of the four groups, 5% of respondents fell into this category. The characteristics that distinguish members of this group from the general public are their slightly lower educational attainment (17% are college graduates), slightly lower levels of broadband access (18%), and the fact that 85% are women.